Brussels splashed more than half a billion pounds on directly promoting the EU last year, through publicity and communications spending, new research has found. In addition, a further £3.1 billion was awarded to budgets that include a provision for promotional spending, up significantly from the £1.9 billion available in 2008, when a similar audit was last undertaken. The figures, uncovered by Business for Britain in a new report include £100,000 spent on comics and children’s books designed to promote the EU to the very young, leading to charges of “propaganda” and “indoctrination”. The think tank reached the numbers by painstakingly going through the 2014 EU budget line by line. In doing so, they found that €664,099,133 had been spend on what they termed “primary spending”, where the funds were used directly for self-promotion. Another €2,097,541,229 was allocated to secondary spending, to be used on both promotional activities and other items, and a further €1,116,520,243 where some of the budget “may” be used for “self-promotion”. Almost €443 million (£357m) of this money would have come from the UK, though payments into the EU budget. A spokesman for Business for Britain has highlighted that the money used to pay for the comics and cartoons for children came from a budget not included in the ‘Primary’ category. “This demonstrates that significant EU ‘propaganda’ can be funded out of budgets classed as ‘Secondary’ and ‘Tertiary’,” he commented. Available in 23 different languages, the material explains to children why the EU should be supported. 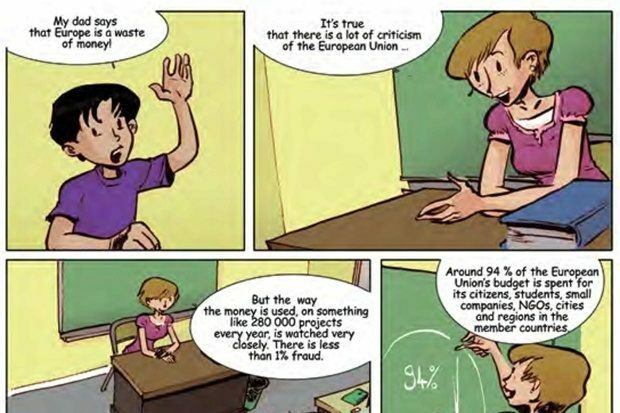 According to The Times, in one booklet, a little boy tells his classmates: “My dad says that Europe is a waste of money.” He is swiftly corrected by his teacher, who informs him that the EU spends its €101 billion budget “very carefully.” She adds that only one percent is lost to fraud, while 94 percent goes directly towards improving peoples’ lives. The European Commission has defended the comics, and other promotional materials, however, insisting that it has a duty to inform citizens of its policies. A spokeswoman for the Commission added that charges of propaganda were “ludicrous”. Yet elsewhere the Commission itself appears to have conceded that its promotional materials at large go beyond simply conveying neutral facts. In its communication strategy, the Commission states its belief that “neutral factual information is needed of course, but it is not enough on its own”. Either way, promotion of the EU’s policies is a task that the Commission clearly takes very seriously: In 2014, the European Commission’s Directorate-General for Communication (DG COMM) was awarded a €246 million (£199m) budget, allowing it to employ a total of 1,029 people. As such, it enjoys both a bigger budget and higher staffing than either the EU’s Directorate-General for the Budget, or the EU’s Directorate-General for Trade. A spokesman for Business for Britain said: “The spending commitments revealed in this report reveals how the size of the EU’s spending in this area has spiralled since the organisation first started to use its budget for ‘information’ campaigns in the mid-1990s. “These findings raise questions about the role which the EU may play in influencing voters during the forthcoming EU referendum. Matthew Elliott, Chief Executive of Business for Britain, said: “With UK taxpayers contributing more and more to the EU Budget, it is staggering that Brussels is throwing away our hard-earned money on propaganda promoting the European project. “Indoctrinating children in classrooms and funding EU-friendly NGOs is a completely inappropriate use of taxpayers’ money when budgets are being cut at home.